Maybe it’s a little strange, but I can’t resist heading outdoors with my camera on frigid, winter mornings to photograph a frosty landscape. It’s so thrilling that I almost don’t even feel the cold! I captured the above image at the beginning of a recent period of brutally cold weather. The weather forecast for upcoming days looked much the same as the conditions that morning, but I was surprised to wake up the next few mornings to no frost whatsoever. Apparently, it was too cold! In fact, it got so cold in the past week that I didn’t take my camera outside at all. Morning temperatures were around -20° F, without windchill! However, one morning at the end of the deep freeze, Jack showed me an incredibly beautiful video of soap bubbles freezing. (He should have known better.) The frost forming on the bubbles was enchanting, and I remembered that ever since my children were little, I’d wanted to try blowing bubbles when it was well below 0° outdoors. Finally (now that my youngest is 20), the conditions were right. So I mixed up a DIY soap bubble solution and headed outdoors with my reluctant assistant who no doubt regretted showing me the video. He blew the bubbles, and I attempted to photograph them. It wasn’t easy! Even though they didn’t pop when they hit the ground, they were like weightless, speedy tumbleweeds! There was a slight breeze, and whenever I tried to scoot a little closer to them to get a better shot, they rolled around too fast for me to catch up with them. It was brutally cold that morning, close to -30°. Too cold for people and cameras to be outdoors for more than a few minutes, so I didn’t have much time to work with. In the narrow window of opportunity, I managed to get a few shots – but definitely felt the cold! When Mother Nature doesn’t deliver, sometimes you have to take matters into your own hands and make the best of it. Whatever gets you through the winter! 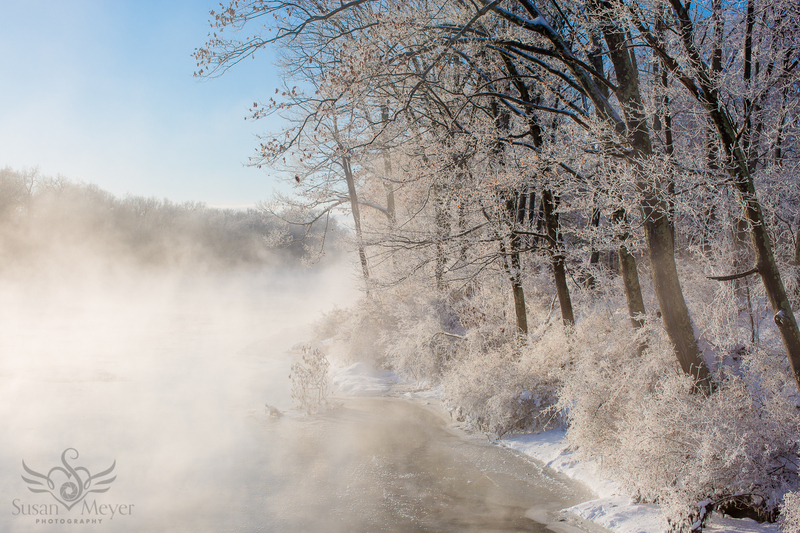 This morning, for the first time in a while, I noticed some frosted trees in a certain area along the river. I had a plan: I’d snowshoe to the dam, which was next to the frosted trees, for a good view. I hadn’t photographed frosted trees from that spot yet. So I started on the path but was delayed because I noticed glistening, frosty branches low to the ground along the river and couldn’t resist stopping for a closer look. I spent the next half hour or so photographing the delicate, feathered frost on low branches and noticed that, viewed through my macro lens, the frost resembled ferns and trees. By the time I made it to the dam, there was no more frost left on the trees. However, I sat on a rock and appreciated the warmth of the sun on my face. After a string of such brutally cold days when the air hurt my face, it was a pleasure not to take for granted. As I sat on the rock, I realized my morning walk was a metaphor for how I want to journey through life. You can have a destination in mind, but be sure to enjoy the journey! After all, we spend more hours working toward goals than we do attaining them, right? And when we achieve a goal, there’s always a new one to work toward. So we’re constantly working toward something. But what do we miss along the way when we’re focused on a particular outcome? I thought of all the times I was on the river stalking herons or bald eagles, determined to paddle back home with a decent photograph but missing so many other opportunities along the way – like turtles, dragonflies, or the reflection of sunlight on the surface of the water projected onto the trees so it appears like cells of light flowing down the branches to the center of the tree. The other day, I got triggered by a situation and felt my life was falling short, in a big way. That kind of thinking is my kryptonite, and I spent the next day trying not to cross over to the dark side of poverty consciousness and general unworthiness. Focusing on gratitude helped a lot. While showshoeing late in the afternoon, I felt grateful because there was enough snow for snowshoeing and because it stayed light late enough for me to go snowshoeing when I finally got home. Also, it was so wonderful to be outdoors breathing fresh air that didn’t hurt my face! As I snowshoed and drove around, I repeated the words over and over because it was really important to reprogram my thoughts and let the message sink in. Create new neural pathways. Our journey through life is so much more enjoyable when we appreciate what we already have and believe we are already whole and complete and don’t need to achieve a particular goal to have value and worth and to feel good. If we can have a lighter attitude of curiosity and joy and not be so heavy and serious, we can experiment with growing and expanding toward our goals without making our worth dependent on a successful outcome. We can notice more, follow our intuition, and feel good as we travel along, not only when we finally arrive. We can even give ourselves freedom to fail, which I believe is good practice. This morning, falling in love with the frosted branches along the way made the whole journey worth it. The destination wasn’t dazzling, and therefore I didn’t get pictures of frosted trees. However, the journey – of curiosity and delight – made up for it. So this is a little reminder not to be so focused on the end result (whatever it is for you) that you deprive yourself of tiny pleasures, positive thoughts, and intuitive nudges that make the journey more delicious. Enjoy the journey, knowing you are already enough exactly as you are right now! © 2018 Susan Meyer. All rights reserved. To use any or all of this article, include this exactly: Susan Meyer (SusanTaraMeyer.com) is a photographer, writer, clutter coach, feng shui consultant, and mindfulness teacher whose work is infused with a deep interest in the nature of mind and appreciation of the natural world. She lives on the Hudson River in Upstate New York. There's so much I want to share with you! Join my mailing list to receive the latest news and updates. And don't worry: I won't spam you or share your info with anyone!